High quality 300gsm full colour double sided flyers from £40 including delivery. All professional businesses need a letterhead. Ours are printed in full colour from £85 for 250. Plastic, cards available from £140 for 250 – Metal cards also available on request. Customised VIP Tyvek and Plastic wristbands available from £65 for 500 – All colours. Printed full-colour on a 350gsm heavyweight silk board – from £50 for 250. If it can be printed, then we can do it – give us a call today or email for a bespoke quotation. 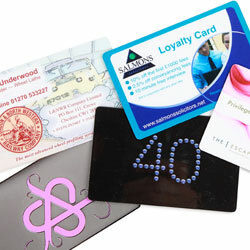 Our plastic datacards are an economic way of producing plastic cards to hand to your customers. They are printed the same size as a standard credit card (85x54mm) and supplied with rounded corners. 2 constructions are available – a printed card core or a printed plastic core, with a plastic laminate to both sides. We can also produce complete 700 micron litho printed plastic cards, signature strips, magnetic data, or individual numbering or personalization – call us for a quote. Prices exclude VAT at 20% and include delivery. Prices are exclusive of VAT & inclusive of delivery. Please read our basic terms and conditions below, and our detailed terms and conditions at the foot of our website before placing an order. Turnarounds do not become valid until receipt of print-ready artwork and payment. If both are received before 9am that will count as the first working day, otherwise the following day is the start date. Delivery will be made between 9 and 6pm to the address indicated on the supplied invoice which you should check carefully. We operate on the basis that this is a business address and accessible within these hours; if this is not the case you should make arrangements to be on the premises from no later than 9am on the day of delivery. Its also your responsibility to notify us should deliveries fail to arrive, we cannot verify your deliveries for you unless arranged. Orders once placed are incapable of cancellation as they will go immediately to print regardless of whether payment has been made. However despatch may be delayed if payment is not made promptly. *You agree that Century 23 shall not be held liable for any financial, third-party or other liability should we fail to deliver on the stated date. Turnaround times imply simply that we will always aim to despatch in this time. Century 23 make no commitment that if circumstances outwith our control transpire we will assume liability for such. In addition once the order is despatched the job is then in the hands of our couriers, we can take no responsibility for failure on their part to delivery and their liability is limited to the cost of the delivery only in case of failure. For more info see our terms and conditions. Decide which product you wish to order and then click on the orange price underneath it. This will bring up the order screen showing the details of your order. Follow the instructions there to complete. Payment is made by credit/debit card via the site of our secure provider – PayPal. Copyright © 2011 Century 23 | Terms & Conditions | Century 23 is a trading name of Waldorf & Statler Limited.